The idea was simple enough. Jesus came and started a movement - His flock, His family, His building, His Bride - His Church. This group of people were to put Him first in their lives, do life together and tell other people about Him. Simple? I've been around church all of my life. Been involved in it in many different ways. An impressionable kid, a questioning teenager, a doubting adolescent, a committed believer and unsure but passionate leader. One thing I have come to know through all my experience is that church can be anything but simple. 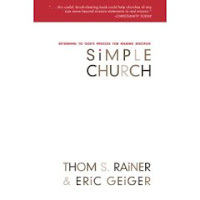 Reading a book called Simple Church I find my heart longing for the revolution it suggests has begun. We seem to be great at doing what the religious leaders of the day did. "The rabbis put yokes of teaching on the people that was impossible and legalistic. The yokes pushed people away from the grace of God instead of towards it." In fact my experience in church life is that we all, leaders or not, seem to like putting unnecessary yokes of teaching and expectations on each other. Lets get back to simple (Matt 11 v 28 - 30) and drop our long list of rules, regulations, pet beliefs. Ultimately Jesus was offering grace to mankind. A simple relationship with God.